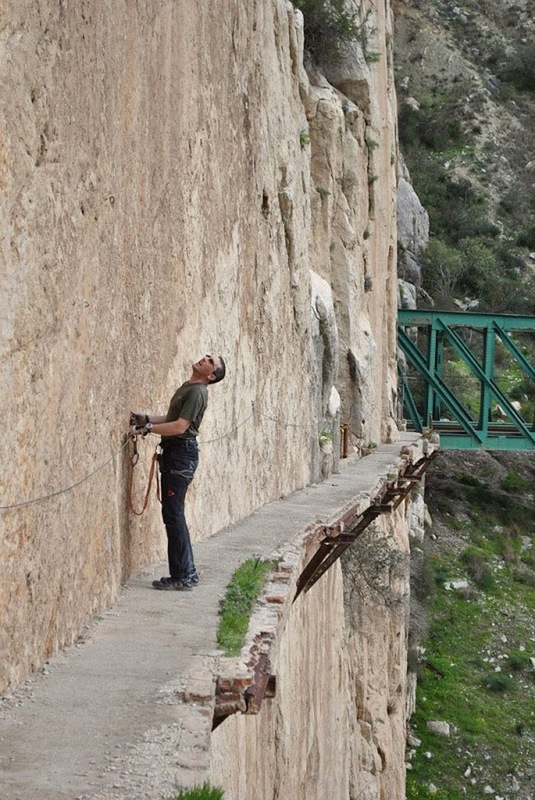 You’ll Get Arrested Attempting This… Because It’s Clinically Insane. Just Watch And You’ll See Why. Home » earth » europe » malaga » mountains » spain » You’ll Get Arrested Attempting This… Because It’s Clinically Insane. Just Watch And You’ll See Why. 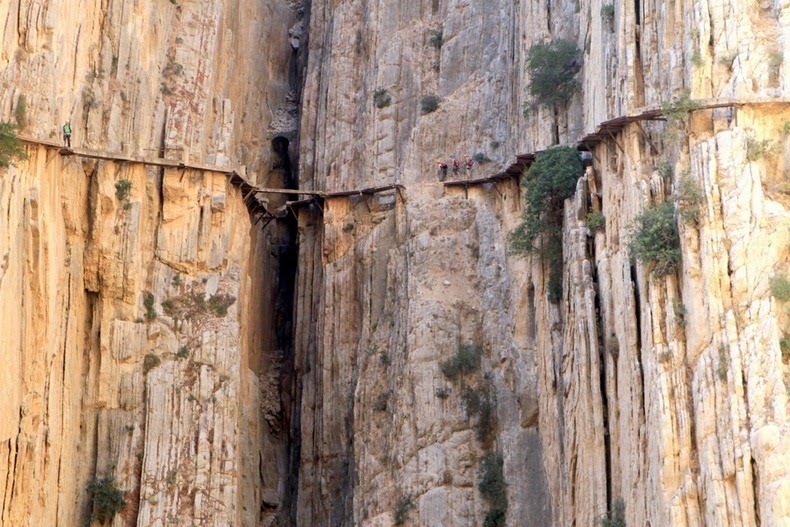 El Caminito del Rey or “The King’s Little Path” is often regarded as the most dangerous walkway in the world. 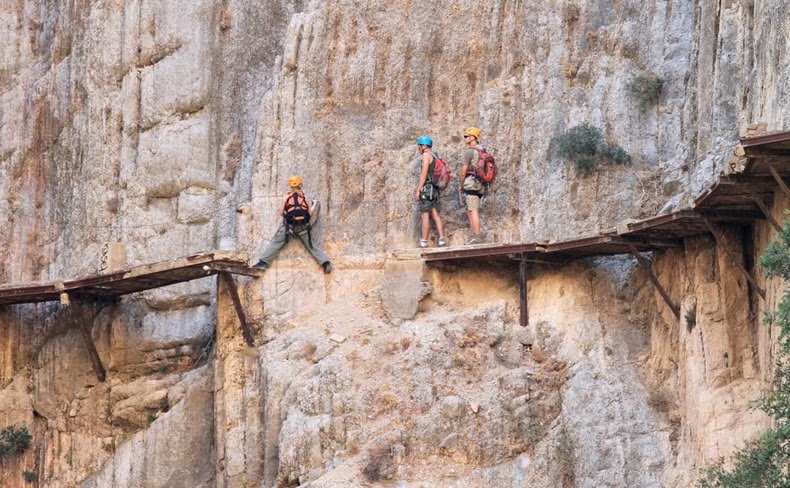 This old walkway, now fallen into disrepair, is pinned along the steep walls of a narrow gorge in El Chorro, near Álora in the province of Málaga, Spain. The walkway was built between 1901 and 1905 to provide workers the means to cross between two hydroelectric power plants at Chorro Falls and Gaitanejo Falls. 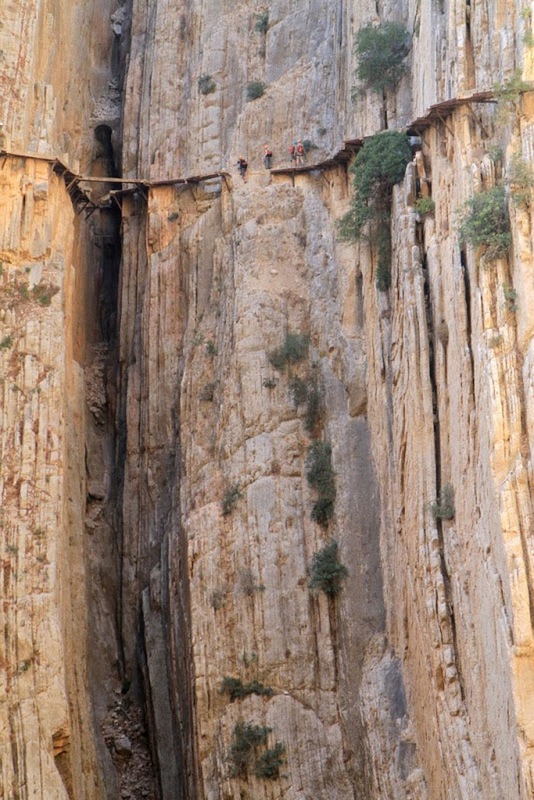 These days the walkway is closed to the public, but that hasn’t stop thrill seekers from walking the narrow mountain walkway. 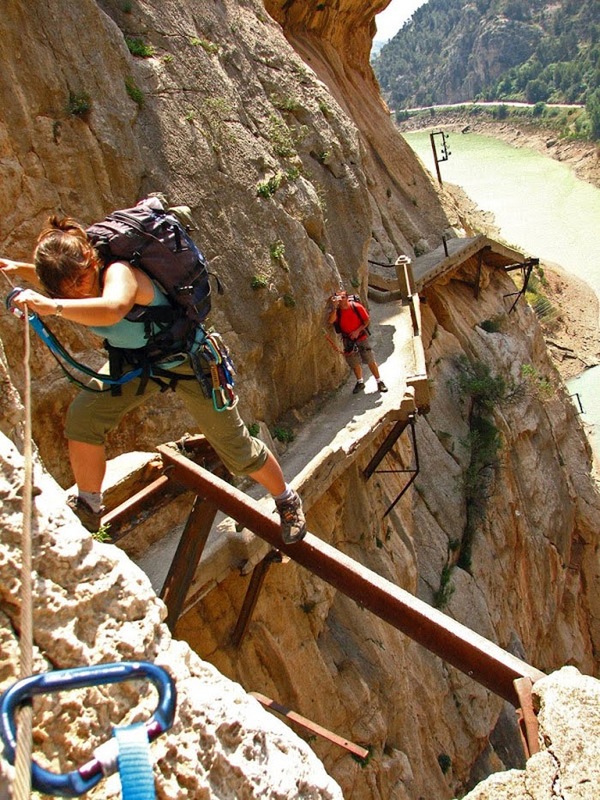 The walkway is 3 feet and 3 inches (one meter) in width, and rises over 350 feet 100 meters) above the river below. The walkway was completed in 1905, but the inauguration did not take place until 1921 when Spanish King Alfonso XIII crossed it and the walkway’s been called The King’s Pathway since. Constructed of concrete resting on steel rails supported by stanchions at around 45 degrees into the rock face, it is currently in a highly deteriorated state and there are numerous sections where part or all of the concrete top has collapsed. The result is large open air gaps that are bridged only by narrow steel beams or other support fixtures. Very few of the original handrails exist but a safety-wire runs the length of the path. 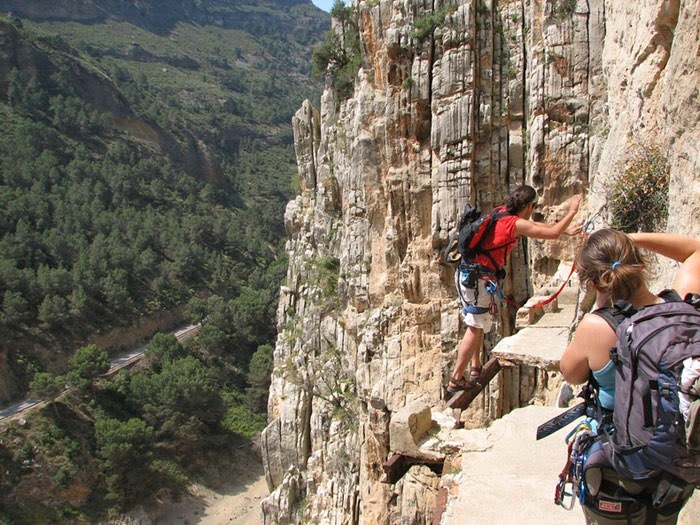 This has however turned El Caminito del Rey into an extreme vacations attraction and crossing the whole is an adventure sport for tourists. The walkway is over 1.8 miles (3 kilometers) long. After several fatal accidents, the local government closed the path in 2000. 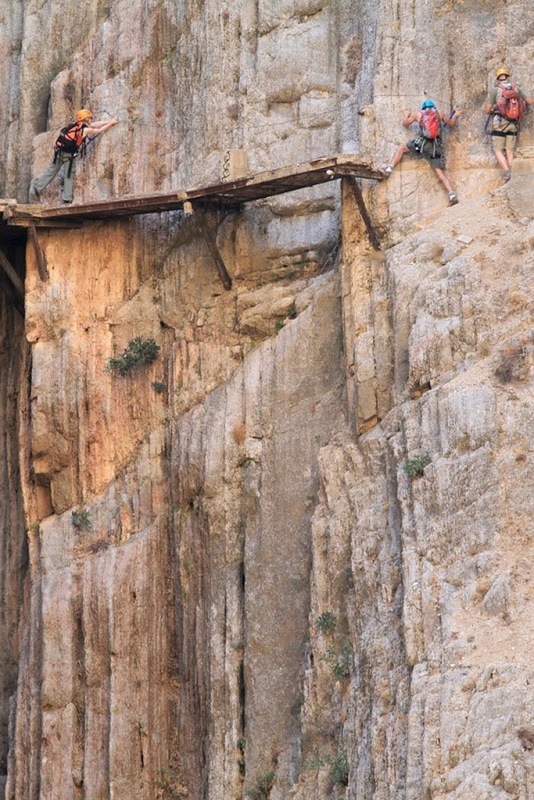 But there are still daring hikers who manage to get around the barriers and make their way across the gorge. The photos don’t do it justice? Okay, here’s a video. The 1:25 mark made me a little queasy. In June 2011, the regional government of Andalusia and the local government of Málaga agreed to share costs of restoration (including car parking and a museum) of €9 million. The project will take approximately three years to complete once it gets underway. Many of the original features will remain in place and the new materials that are used will be in keeping with the old design. So if you are the thrill seeking type, then El Caminito is calling your name before it gets turned into a busy tourist attraction. 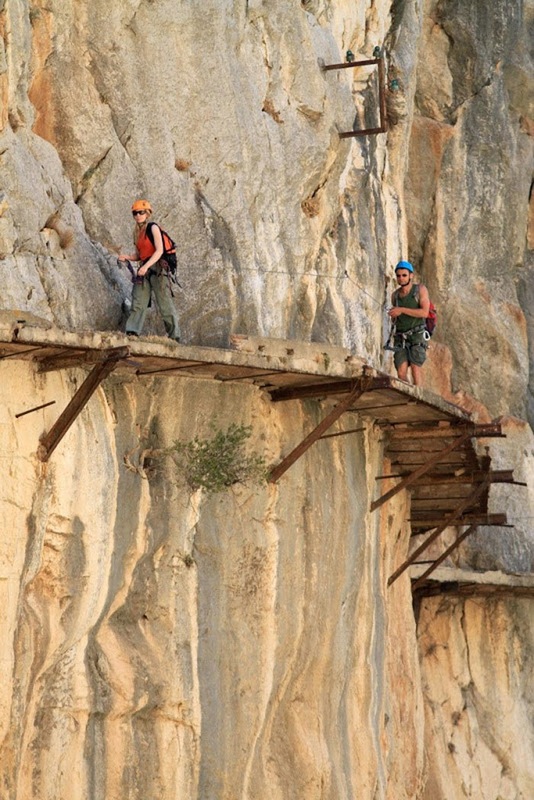 Share this crazy walkway with your friends below.